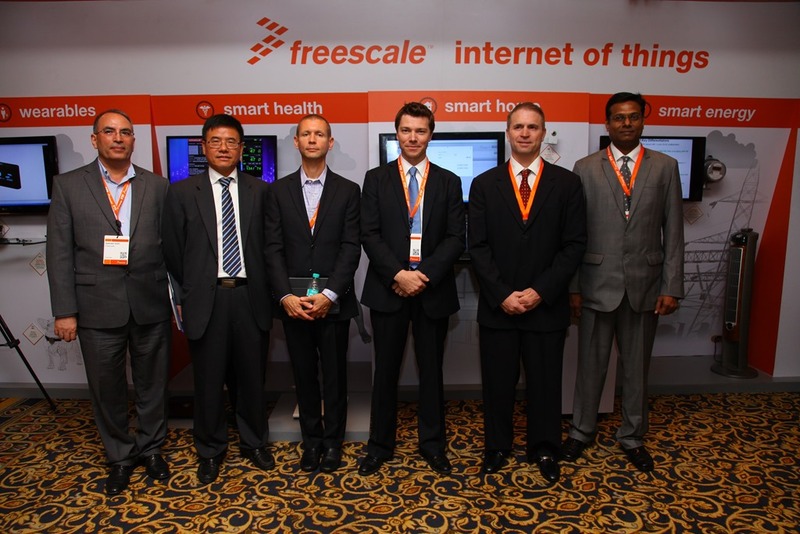 Freescale Semiconductor (NYSE: FSL), a global leader in embedded processing solutions opened the 9th edition of the company’s annual technology summit, Freescale Technology Forum (FTF India) (#FTFIndia) today at Hotel Leela Palace, Bengaluru. The focus of FTF India 2014 is on Internet of Things (IoT). At FTF India, Freescale showcased over 60 innovative demos and a range of futuristic devices on Internet of things (IoT) at IoT Wall. IoT wall is a concept wall that showcases the future of IoT and how it will make everything around us SMART. The two day event witnessed participation from people spanning Freescale’s customers, eco-system partners, academia and employees. At the event, Freescale also announced the winners of the Kinetis L Series MCU Design Challenge in India. The IoT Wall was the major highlight of the event as Freescale showcased and demonstrated range of futuristic devices that explained the concept of IoT and how it will make everything around us SMART. The wall showcased devices like Smart Watch, Wearable Camera, Fitness Watch, Heart Beat Meter, Posture Monitor Waist Band, Dog Tracker, IoT Gateway, etc. FTF India provided attendees an opportunity to meet and explore the latest innovations in embedded design from Freescale and its eco-system partners. The two days event also provided attendees with over 77 hours of training in the domain of Automotive, Networking, Consumer, Healthcare, Industrial, Smart Energy, Software and Design Services. Later at the IoT showcase, James Bates, SVP, & GM, Analog & Sensors, Freescale said, ‘’One promise of IoT is that the connected electronic devices will sense and monitor our environment, consult information acquired from the cloud and respond with appropriate physical action to enhance our convenience or safety or both. Today personal medical devices and telehealth applications connected to IoT offer tremendous potential for monitoring our aging population and improving our overall quality of life. In fact, the inspiration for our ant-sized Kinetis microcontroller K2 launched earlier this year was from a customer request where they were asking for help in creating a wireless device small enough to be easily swallowed and cost-effective enough to be considered ‘digestible’, pinpointing problems and eliminating exploratory surgery”. Freescale also announced the winners of the Freescale Kinetis L Series MCU Design Challenge. The Design Challenge that ran for 6 months ended in July 2014 and received over 800 entries from electronics design engineer community including professional electronics design engineers, hobbyists & budding engineers. Saravana Pandian Annamalai won the first prize (INR 100,000) with a prototype on Smart Home with IoT, Kaustubh Digambar Tapke won the second prize (INR 75,000) with his prototype on solar powered autonomous micro patrol boat for sea surface inspection while Ashok R won the third prize (INR 50,000) with his prototype on Sketch Drive Car. Freescale is committed to leverage the leadership positions across verticals and deliver differentiated solutions required to unleash the potential of the Internet of Things. India is one of the major focus markets along with the US, China and Japan for R&D activities and development of the next generation of embedded technologies.